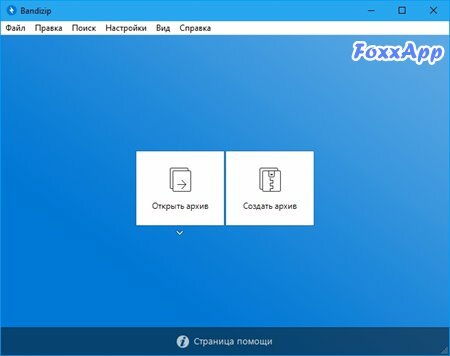 • Сжатие и распаковка: Zip(z01), ZipX(zx01), TAR, TGZ, 7Z(7z.001), LZH, ISO, EXE(e01). • Только распаковка: RAR(part1.rar, r01), ACE, ALZ, APK, ARJ, BH, BZ, BZ2, CAB, EGG, GZ, J2J, JAR, IMG, IPA, ISO, LHA, LZH, LZMA, PMA, TBZ, TBZ2, TGZ, TLZ, TXZ, UDF, WAR, WIM, XZ, Z.
BandiZip - is an intuitive and fast archiving application that supports WinZip, 7-Zip, and WinRAR, as well as other archive formats. BandiZip supports for ZIP, 7Z, RAR, ALZ, EGG, TAR, BH, LZH, GZ, BZ2, ISO, CAB, WIM, XZ, ARJ, and Z archives files and users can create self-extracting files (.EXE) and multi-volume (split) archives files. Bandizip has very fast Zip algorithm for compression / extraction by "Fast Drag and Drop" and "High Speed Archiving" function.